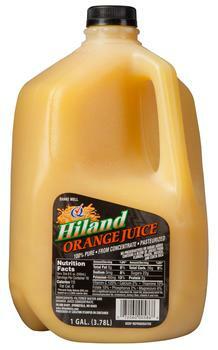 Hiland Dairy is recalling Hiland Dairy Orange Juice and Tampico Citrus Punch, produced at its Omaha, Neb., facility. The products may contain milk protein, an allergen not declared on the label. No illnesses or allergic reactions have been reported at this time. Customers who purchased the recalled products should discard them or return them to their local retailer to exchange for a like item.